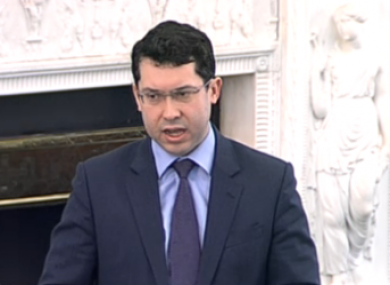 SENATOR RÓNÁN MULLEN has warned his Seanad colleagues not to slip into “double-think” in condemning last week’s shootings in Newtown, Connecticut while also advocating the introduction of a new legal framework for abortion. Speaking in the Seanad this afternoon, the NUI senator said he was ‘troubled’ that children’s minister Frances Fitzgerald, speaking in the Dáil yesterday on the report of the Expert Group into the A, B and C case, had not mentioned the welfare of unborn children. Mullen was speaking after several other senators, in the Seanad’s first day back after the weekend, had expressed shock and sympathy at Friday’s events at Sandy Hook elementary school in Newtown in which 27 people, including 20 young children, were shot dead. “I find entirely appropriate that we would join in solidarity with the people, with the children who died in Connecticut,” Mullen said. “Let’s be sincere about that. “And let’s not slip into a double-think either, however, where we forget a whole category of children in our own country. “The government has a very serious decision to make in these weeks and months on the abortion issue, as we all know. “I find it very troubling that having done so well as Minister for Children, that Minister Frances Fitzgerald – in her speech yesterday – appeared to show no concern for unborn children,” he said, prompting heckles and jeers from members on the government benches. Moving onto yesterday’s comments from the UN special rapporteur on the right to health, Anand Grover, who had told RTÉ News that abortions should be available to women not only where their lives were at risk, but also where their health could be adversely affected. Grover had said what had happened to Savita Halappanavar, the Indian woman who died at a Galway hospital in October after being refused a termination of her stillborn foetus, “would never happen in India”. The Cabinet this morning discussed its plan of action on how to respond to the Expert Group’s report, and is expected to recommend a ‘legislation plus regulations’ approach to addressing the legal uncertainty in the area. Email “Mullen warns of 'double-think' on X Case after Newtown massacre”. Feedback on “Mullen warns of 'double-think' on X Case after Newtown massacre”.